Instructional time begins at 8:00 am and runs to 3:20 pm daily. The tardy bell rings at 8:05 am. After 8:05, students are required to sign-in at the front office. The main entrance to the school is unlocked at 7:30 am. Students arriving between 7:15 and 7:45 will wait in the gym or cafeteria until their teacher takes them to their classrooms. Staff will be available to assist students arriving between 7:45 and 8:05 as they walk to their classrooms. In the interest of your children's safety, the doors will remain locked during school hours. Access is permitted through the front entrance only. All volunteers and visitors must sign-in and wear a badge during school hours. Please have your driver's license available when signing in. For the safety of our students, parents will not be allowed after the 2nd week of school to walk their students to their class nor come into the building to pick their students up at the end of the day. 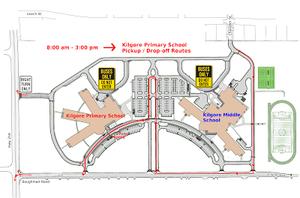 All students who are car riders will be dropped off in the mornings and picked up in the afternoons in the front of the school. Staff will be on duty to monitor and assist students as doors open in the morning at 7:15 and at the end of the school day at 3:20.